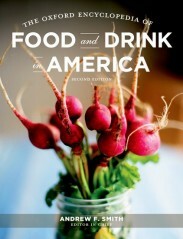 The Oxford Encyclopedia of Food and Drink in America, Second Edition can be found on Oxford Reference, the home of Oxford's quality reference publishing. There is something quintessentially American about peanut butter. While people in other parts of the world eat it, nowhere is it devoured with the same gusto as in the United States, where peanut butter is ensconced in an estimated 85% of home kitchens. Who exactly invented peanut butter is unknown; the only person to make that claim was Dr. John Harvey Kellogg, the chief medical officer at the Sanatarium, the fashionable health retreat in Battle Creek, Michigan. Kellogg, a vegetarian who invented Corn Flakes, was seeking an alternative for “cows’ butter.” He thought puréed nutmeats might work, and in the early 1890s Kellogg experimented with processing nuts through steel rollers. He served the nut butters to his patients at the Sanatarium, who loved them. Remarkably, in less than a decade peanut butter would emerge from the province of extremist “health nuts” to become a mainstream American fad food. America’s elite visited the Battle Creek Sanatarium to recover their health, and many fell in love with the foods served there—particularly peanut butter. It soon became a passion with health-food advocates nationwide, and newspapers and magazines quoted vegetarians extolling its virtues. A vegetarianism advocate, Ellen Goodell Smith, published the first recipe for a peanut butter sandwich in her Practical Cook and Text Book for General Use (1896). Homemade peanut butter was initially ground in a mortar and pestle, but this required considerable effort. It was also made with a hand-cranked meat- or coffee-grinder, but these did not produce a smooth butter. Joseph Lambert, an employee at the Sanatarium, adapted a meat-grinder to make it more suitable for producing nut butters at home. He also invented or acquired the rights to other small appliances, all intended to simplify the making of nut butters. These included a stovetop nut roaster, a small blancher (to remove the skins from the nuts), and a hand grinder that cranked out a smooth, creamy product. In 1896, Lambert left the Sanatarium and set up his own company to manufacture and sell the equipment. Lambert mailed advertising flyers to households throughout the United States, and some recipients who bought the equipment started their own small businesses selling nut products. As nut butters became more popular, these machines proved inadequate to keep up with demand, so Lambert ramped up production of larger ones. He also published leaflets and booklets extolling the high food value of nuts and their butters. His wife, Almeda Lambert, published A Guide for Nut Cookery (1899), America’s first book devoted solely to cooking with nuts. Vegetarians — who at the time practiced what we may now consider veganism — enjoyed all sorts of nut butters, which weren’t simply novel spreads for sandwiches but also sustaining, high-protein meat substitutes. But peanuts were the cheapest nuts, and it was peanut butter that dominated the field. It was first manufactured in small quantities by individuals and sold locally from door to door, but before long, small factories sprang up and peanut butter became a familiar article on grocers’ shelves. The American Vegetarian Society (AVS) sold peanut butter and actively promoted its sale through advertisements in magazines. In 1897 the AVS also began promoting the sale of the “Vegetarian Society Mill,” with an accompanying eight-page pamphlet encouraging vegetarians to create home-based peanut butter businesses. Vegetarians all over the country began to manufacture commercial peanut butter. The Vegetarian Food & Nut Company, in Washington, D.C., sold a product called “Dr. Shindler’s Peanut Butter” throughout the United States for decades. The company also produced private-label peanut butter for grocery store chains, and non-vegetarians quickly adopted the tasty new product. The Atlantic Peanut Refinery in Philadelphia, launched in December 1898, may have been the first company to use the words “peanut butter” on its label. The term was picked up by other commercial manufacturers, although a New Haven, Connecticut, manufacturer preferred the term “Peanolia,” (later shortened to Penolia), and registered it in 1899. By 1899, an estimated two million pounds of peanut butter were manufactured annually in the United States, and by the turn of the century, ten peanut-butter manufacturers competed for the burgeoning US market. From its origin just six years earlier as an alternative to creamery butter, peanut butter had established itself as an American pantry staple and a necessity for schoolchildren’s lunch pails. Headline image credit: Peanut Butter Texture, by freestock.ca. CC-BY-SA-3.0 via Wikimedia Commons. Andrew F. Smith teaches culinary history at the New School University in Manhattan. He has written or edited 26 books, and served as editor for The Oxford Encyclopedia of Food and Drink in America, which is available as part of Oxford Reference.